When a trio of Florida-residing Minnesota natives planned to host a high-end reception to raise funds for two Minnesota-based programs close to their hearts, the team at The Saint Paul Foundation knew the invitation needed to make an impression. 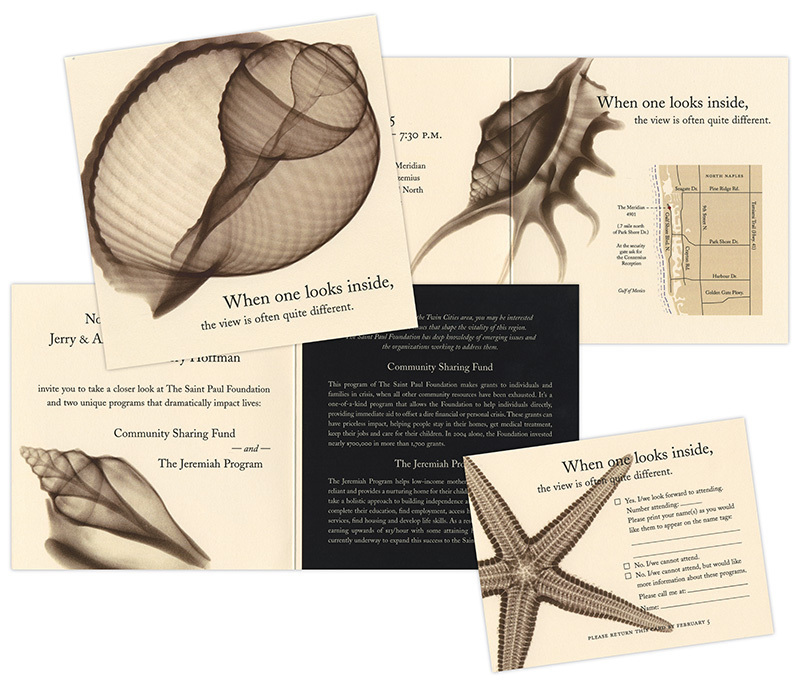 The tagline “When one looks inside, the view is often quite different” accompanied x-ray images of seashells. The two programs highlighted at the event were the Community Sharing Fund, which makes grants to individuals and families in crisis, and The Jeremiah Program, which helps low-income mothers become self-reliant. In both cases, the hosts wanted guests to take an empathetic look at individuals who may present a façade of self-reliance, but may have been dealing with issues relating to housing, healthcare, childcare, self-esteem, lack of education or opportunity, and life skills.